Work is thrown on either a slow Leach kickwheel or a Shimpo electric wheel. I use DSS clay from Doble’s for stoneware, and Audrey Blackman porcelain from Valentine’s. 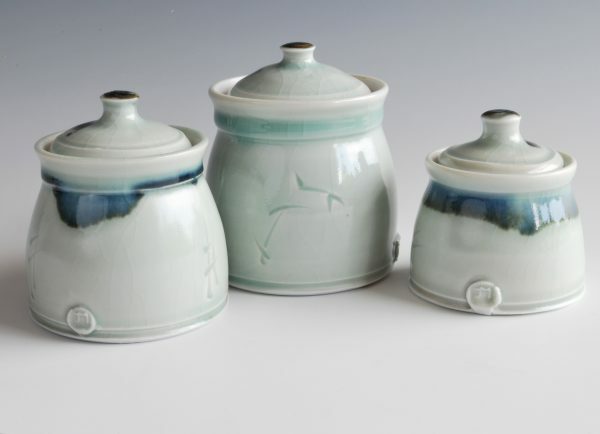 For stoneware I use ash, tenmoku, shino and talc glazes, and for porcelain, a celadon glaze. All work is reduction-fired in a propane kiln. The ‘splash lines’ I use on many of my pots came originally from making patterns while cleaning the bath! I thought, this could work on a pot, so I tried it with iron oxide the next day!